Insomniac by Enrique Iglesias. Condition is Very Good. Shipped with USPS Media Mail. 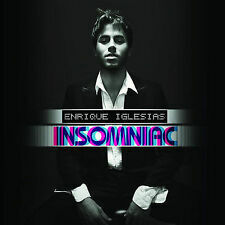 Title: Insomniac Artist: Enrique Iglesias Genre: Rock/Pop|Pop Duration: 59.20 mins Format: CD / Album Type: CD No. of Discs: 1 disc(s) Studio / Label: Interscope UK Release Date: 22 Jun 2007. (Artist: Enrique Iglesias featuring Lil' Wayne : Push. 4 Do You Know?. (The Ping Pong Song). Style: Pop Rap, Pop Rock. Genre: Hip Hop, Rock, Latin, Pop. Format: CD, Maxi-Single, Promo. CD, DVD. )UNLESS specifically stated above and/or in the title. An item in used but good condition. The cover art and liner notes are included for a CD. VHS or DVD box is included. No skipping on CD/DVD. An item that is used but still in very good condition. The cover art and liner notes are included. 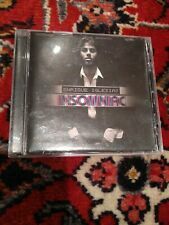 For sale is Insomniac by Enrique Iglesias (CD, Jun-2007, Interscope (USA)). Bill and Rachel. Excellent like new condition. Booklets are all in excellent like new condition as well. 17 Not In Love (Armand Van Helden Club Mix) 9:13. 16 Hero (Thunderpuss Edit) 3:20. 15 Amigo Vulnerable 4:01. 14 Alguien Soy Yo 3:59. 11 Sweet Isabel 3:13. 10 Stay Here Tonight 4:13. These marks do not affect play in any way. We will do our best to get to your request asap! We've built our reputation on having a vast selection of CD's at affordable prices. We're excited to bring you the. 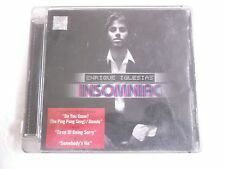 This is the Enrique Iglesias "Insomniac" CD, released on Interscope in 2007. Catalog # B0008964-02. Case has general scuffs & scratches, cracks on upper right corner & back of cover, promo stickers on front of case. Do You Know?. Catalogue number: ENRIQUE1. ENRIQUE IGLESIAS: Insomniac. The CD is on the Interscope Records label, Cat No 1734820, released in 2007. CD made in the EU. EAN 602517348202. The CD is in mint condition, but there is a short crack (c 1 cm) in the back of the jewel case. CD SINGLE FROM ENRIQUE IGLESIAS - DO YOU KNOW. ALBUM VERSION. CD has been cleaned and Tested. Sweet Isabel 3:15. Stay Here Tonight 4:15. Little Girl 3:47. Wish I Was Your Lover 3:25. Miss You 3:23. ENRIQUE IGLESIAS Tired Of Being Sorry – 2007 UK CD PROMO – Pop – BARGAIN! Tired Of Being Sorry. PROMO with release info/artist info promo sticker on reverse of case. 2007 UK CD from Interscope Records. Genre: Pop. ITEM CONDITION : NEW SEALED FROM FABRIC,NEVER OPEN BEFORE. Artist: Enrique Iglesias. Title: Tired Of Being Sorry. Very Good Condition. Main Version. CD used for promotional purposes, in mint/near mint condition in jewelcase. Great collectors item:- promotional CD as given to Radio Stations and Music Reviewers, limited availability. Do You Know?. Title : Insomniac. Artist : Enrique Iglesias. Condition : Good. Product Category : Music. List Price (MSRP) : 13.98. CD in mint/near mint condition in jewelcase. Do You Know?. (The Ping Pong Song) 3:40. CD in mint/near mint condition in jewelcase. Great collectors item:- promotional CD as given to Radio Stations and Music Reviewers, limited availability. Do You Know?. As described. Quick service. New arrivals. UK Based Charity. You won't find cheaper prices anywhere! High quality products at amazing prices. We're here to help whenever you need us. Dedicated Support. The album cover/ artwork is included. No skipping on CD. Create your Like Badge. HT Bargain Buy. ENRIQUE IGLESIAS. ENRIQUE IGLESIAS Do You Know ?. Do You Know ?. [The Ping Pong Song] - Remixes. [The Ping Pong Song] - Ralphi Rosario & Craig CJS Vocal Mix 9:30. [The Ping Pong Song] - DJ Dan Remix 7:16. Label: Interscope Records ‎– TY0215C. Enrique Iglesias ‎– Insomniac. Format: CD, Album. 6 Tired Of Being Sorry 4:03. 15 Amigo Vulnerable (Spanish Version Of Tired Of Being Sorry) 4:01. ENRIQUE IGLESIAS. USA £0.95, extra copies add £1 per item. This item is in mint or excellent condition unless stated above. CATALOGUE No RECORD LABEL. Enrique Iglesias ‎– Insomniac CD. OTHER PRODUCTS Check other products that we have available for sale. IF YOU HAVE ANY DOUBTS ABOUT THIS PRODUCT YOU CAN REVIEW THE PUBLISHED IMAGES IN DETAIL. 16 Hero (Thunderpuss Edit) 3:20. Artist: ENRIQUE IGLESIAS. Label: INTERSCOPE. Year: 2007. Format: CD. ENRIQUE IGLESIAS. USA £0.95, extra copies add £1 per item. CATALOGUE No RECORD LABEL. 1Do You Know ?. (Album Version) 3:40 2Do You Know ?. (DJ Dan Remix) 7:16. Title: Insomniac. Artist: Enrique Iglesias. Released: 2007. Grading codes: M (Mint/New), NM (Near Mint), VG (Very Good Plus), VG (Very Good), G (Good Plus), G (Good), F (Fair), P (Poor). 17 Not In Love Feat. 1 Ring My Bells 3:56. 16 Hero (Thunderpuss Edit) 3:17. 15 Amigo Vulnerable (Spanish Version Of Tired Of Being Sorry) 4:01. 11 Sweet Isabel 3:15. ENRIQUE IGLESIAS. (Promo album). PERFECT FOR THOSE FANS WHO WANT TO COLLECT IT ALL. DUE TO RECENT GROWING TREND. If 'Album' is not stated - then it clearly isn't an album! CD AND INSERT ARE BOTH IN VERY GOOD/EXCELLENT CONDITION. This is an original recording and not a copy. Author/Artist: Enrique Iglesias. (Item #ZB000Q364M4Z2|0). Condition: Very Good.